Born in York County, PA seventy five years ago, Del McCoury would once have seemed an unlikely candidate for legendary status. Bitten hard by the bluegrass bug when he heard Earl Scruggs' banjo in the early '50s. McCoury became a banjo picker himself, working in the rough but lively Baltimore and D.C. bar scene into the early 1960s. He got his first taste of the limelight when he joined Bill Monroe's Blue Grass Boys in early 1963; the Father of Bluegrass moved McCoury from the banjo to guitar, made him his lead singer, and gave him a lifetime's worth of bluegrass tutelage direct from the source. 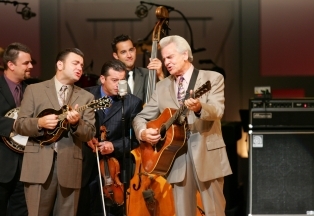 Flash­forward to 1990s and the Del McCoury Band is on top of the bluegrass world, along the way giving birth to a more startling phenomenon: the emergence of the group onto the larger musical scene as a unique torchbearer for the entire sweep of bluegrass and its history. For it turned out that the unmistakable authenticity of McCoury's music­along with his good­natured willingness to keep alert for new sounds and new opportunities ­had bred fans in some unlikely places.